I'd estimate it is between 10-20 minutes, and it just says Dolphin.exe has stopped working. I googled it and saw another thread where the guy made registries and got the dump files, so I did the same. Can you play games before the crash? Also, this may be an overheating problem. 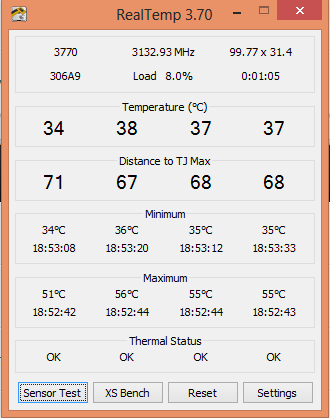 Use RealTemp (or CoreTemp) to get CPU temperatures. CPU-Z and GPU-Z for more CPU & GPU info. (11-01-2013, 07:20 AM)DJBarry004 Wrote: Can you play games before the crash? Also, this may be an overheating problem. Yeah, I can play games no problems with no FPS issues. 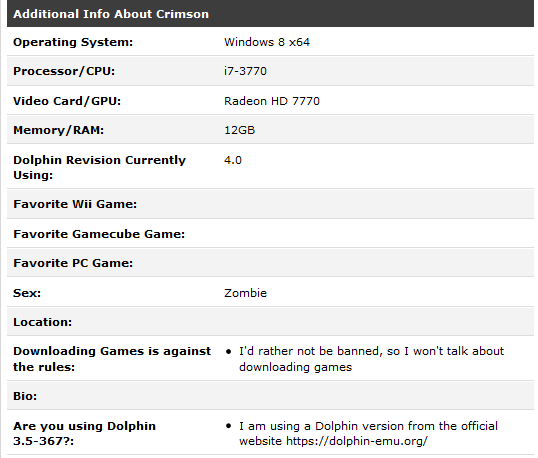 I don't think it's an issue with my temp, I have my PC in a well ventilated area and nothing else crashes, just dolphin. Do you still want me to check it? Yes. It´s just to make sure that there´s nothing going wrong with your CPU. Looks good. And the situation is pretty strange. That means I can´t say a word... for now. Wait for an expert´s help. This is a summary of one of his dump files. Thank you all for the help, I will wait for more help. (11-01-2013, 09:00 AM)xRyudo Wrote: This is a summary of one of his dump files. Should I run as admin?